An attempt has been made in this book to define the nature of Britain’s economic interests in South Africa over the period from the early 1950s until 1970. In the course of the analysis it has been argued that certain of these interests were of special significance to the British government and, in some cases, only of importance to the private economic world of the United Kingdom to the extent that the fortunes of private and public spheres are ultimately linked together. 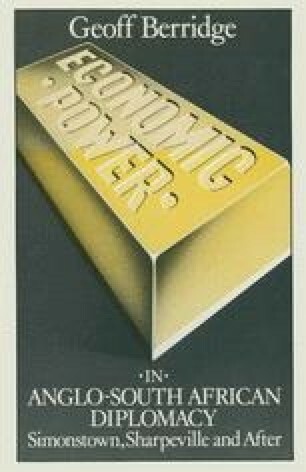 Among the governmental interests which gave the Nationalist regime real leverage at critical junctures were the special attractions of the South African market as a result of South Africa’s gold payments, the agency agreement with the Bank of England for the disposal of South Africa’s surplus gold, and uranium.